One area I see Direct Sales & Network Marketing consultants seriously struggle with is in the area of following up. This is often because they do not have an effective system in place to keep up with their customer’s contact info, notes or a solid process for following up. Even if you have a good system in place, often times you may not follow up out of fear or not knowing what to say to follow up. It’s essential that you offer your customers a wonderful experience from start to finish. Following up is a great way to show how much you care, serve your customers and build relationships. We need to make our people feel valued and appreciated. It’s not just about their money or making a sale. You want to ask questions, listen to people. Be more focused more on how you can help solve a problem for the customer instead of just closing the deal. Have conversations, ask more questions and listen to people. Provide value and solutions. Come from that heart-centered, mission-based way of marketing and sharing your business. Do the unexpected. Go above and beyond. Do the extra little things that people don’t expect or they may not get from anybody else. Treat people how you would like to be treated. Really, truly, it’s a simple golden rule of life, but treat your customers how you would like to be treated as a customer, the gratitude you would like to be shown in what you think would be an incredible superstar experience for someone. If you’re worried about following up with people, with connecting, with sharing your business remember that when you are genuinely focused on helping the customer when you’re being authentic and you’re coming from that place of service, you will never come across as pushy, as salesy, or aggressive. Once you have your mindset focused on serving, connecting and building relationships, your systems and processes will work even better. If you don’t have a good system for following up, you can use mine as an example to base yours on. There are many apps and CRM’s (customer/client relationships management) programs you can use to help with following up. If you are just starting out or want something simple to use, consider using my spreadsheet system. It can be set up in Excel or Google Drive Spreadsheets. I use a very simple spreadsheet with multiple tabs for my customer contact and follow up system. I also schedule in time in my planner for following up with customers, leads, hosts, potential recruits and team members each week. When I schedule in a vendor or networking event, I also schedule in time the days after the event to do follow up. One thing I did not mention in this video, that I wanted to suggest is this post is for those of you who have companies or products where customers are on auto-ship or would be purchasing the products over and over again (networking marketing companies, healthcare, skincare, etc). You could create a tab for your repeat customers / re-orders too so that you could follow up and ask the customer how the product is working for them and remind them about re-ordering. Watch my video below for the details, tips and methods I use to create and maintain a simple, yet effective customer contact & follow up system. Please let me know your thoughts in the comments below & I would love if you would share this on social media or with your teams! This is a great idea. I did not have a good follow up system in place. As a result I was losing the potential for sale by simply not following up and providing good customer service. Thank you. I have not been following up but have spent wasted time trying to organise some sort of system but just couldn’t work it. Seeing this short video I now have a plan to follow. Thank you; I keep re-formatting my follow-up chart, thinking it’s too long or too short or too… For customers (not potentials) do you also track what they’ve purchased in the same chart? 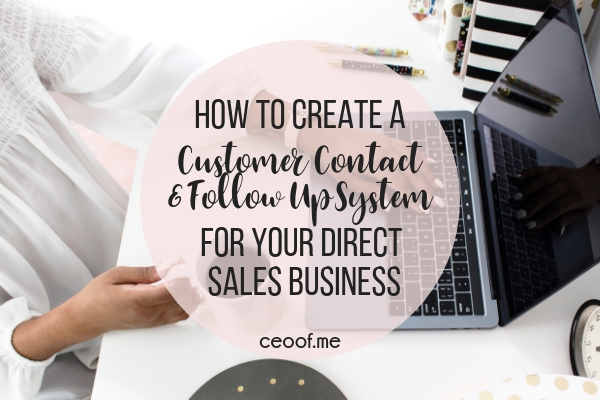 And do you only follow up twice for potential customers? I follow up until they say no! Sometimes, a potential customer needs to know you are committed and not chasing $. Misty, the link for the Excel file spreadsheet is not working.